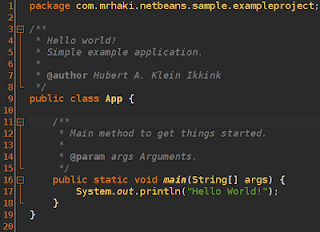 Working with Java source code in NetBeans is very pleasant. I really like the Java editor. And everyday I learn something new. Just recently I discoverd I can collapse all Javadoc in a Java source file with View | Code Folds | Collapse All Javadoc. Especially when the source file contains a lot of code and Javadoc, this makes scrolling through the source a lot more clarifying.